For your convenience, two SuperClubs Resorts in Jamaica give you the option to stay on the grounds and simply walk to our golf courses. Our PGA quality tournament course at Breezes Runaway Bay Resort & Golf Club also has a golf school right on the property. Grand Lido Braco Resort & Spa features the Village Green, a 9 hole par 3 course, to test your skill. Once you've practiced your short game, take the free 15 minute transfer to play our 18 hole course at Runaway Bay. SuperClubs recently added the former Ironshore 18 hole course as the SuperClubs Golf Club  Montego Bay. 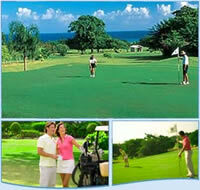 Our total of 45 holes makes us the largest golf supplier in Jamaica. Complimentary Greens Fees and transfers to this course are included for guests of Grand Lido Braco Resort & Spa and Breezes Montego Bay. At all the 18 hole courses carts are available at an additional cost and caddies are mandatory and require an additional charge. If you've never had the privilege of playing a round with the guidance of a caddie before, come and experience golf the way it used to be played. Of course our caddies add touches of warm Jamaican hospitality and are often heard to exclaim ''Solid Gold, Mon!'' after a great drive. With its crisp breezes, rugged topography and breathtaking scenery, Jamaica may well be the best kept secret among golfers.